In the almost desert hall of the hotel, I ask about Tony Gallopin to the girls at the reception desk. One of them picks up the phone, she calls his room, she speaks French. A few words. He already knows everything. He comes down in a few minutes. 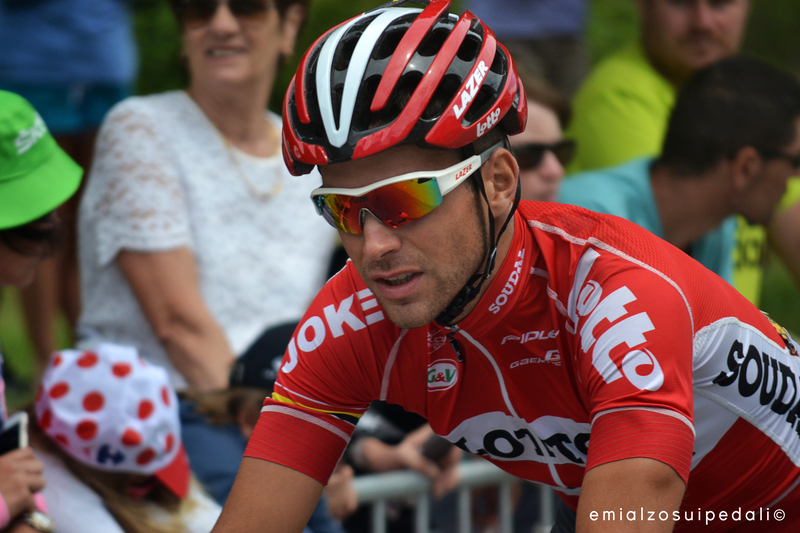 He has the after-race grey suit of his team, on the heart there is written: Lotto Soudal. In red. We shake our hands and we sit down on some little sofas close to the windows. I place the Lombardia’s booklet on the table. And he points to the last roughness of that electrocardiogram on the paper. He goes distractedly through the booklet, then he closes it and he put it back on the table. At the end what interests to the ones who ride, is the altimetry. Most of all, even of the path. It’s the part they have to feel in the legs, better to put the soul in peace from the start. He raises his gaze: he has the eyes between grey, green and lightblue under the dark, thick eyebrows. An incredible contrast of light and shadows. He waits for the questions and this is a phase that I would like to skip too. To ask. I have always been better at listening. But you have to start from something. Better with simple stuff. I ask him if he likes to race in Italy. He makes a strange face and he starts laughing. “No…not really” he admits, smiling. And I am happy because finally someone tells the truth at the first shot. Or at least something different. And he jokes, stretching an arm to tap with the fingers on the table. That is wooden. A propitiatory gesture that is the same as our to touch iron. The forecasts tell rain for tomorrow. Without any break. From the start to the finish. None likes to race under the rain but Tony isn’t certainly one that is afraid of the atmospheric conditions. I remind him this year victory at the Paris-Nice and he smiles. Quite like the Tour that for a French guy is the dream for excellence. Together with the yellow jersey. Maybe, if few years ago, someone would have told him that he would have worn the leader’s jersey of the Grand Boucle on the National Day, he wouldn’t have believed it. But it happened. On the 14th of July 2014 Tony got on the podium with that jersey, he put his hand on the heart and listened to his hymn. If this is the best side, which one is the worst? He tells me that this winter he will spend his holidays on an Island and it will be the best moment of the year. Then the training camps will restart, the first is in December. Brief answers, without frills. He doesn’t really like talking about cycling. He his a striker, what he tells on the road is already enough. During the Tour de France this year he stayed literally attached to the wheels of the best ones on the worst climbs. He doesn’t talk much to the journalists, he tells it himself. And he’s right. This is another difficult thing to change in this sport that is harsh and delicate at the same time. When you don’t look much at the people and you concentrate on classifications, so you loose the sensibility of a work that should be special, but, it stays normal. Tony tells me that he tried cycling as a game. His dad Joel was a professional cyclist and he was a chubby child, not really good at it. Then when he was junior, he started to achieve better results and improve. And so, here I am. It seems he says. 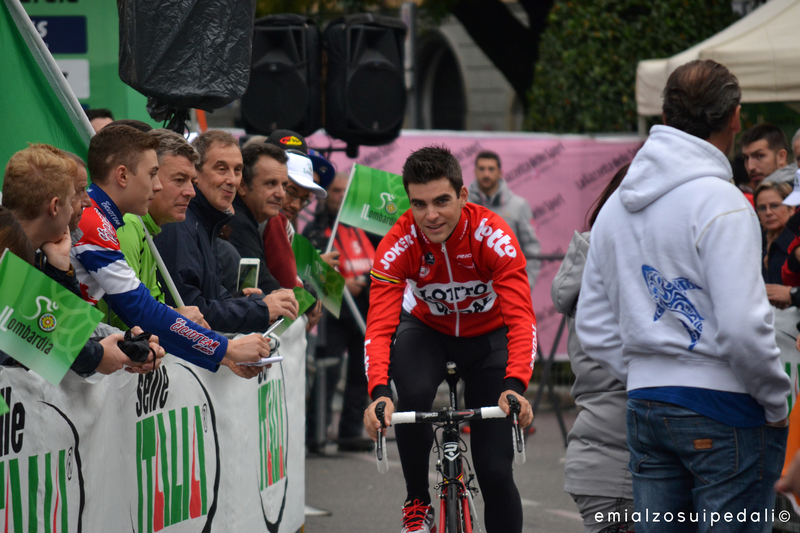 Now he is twenty-seven and this will be his third Giro di Lombardia. We stand up and I’m pleasantly surprised when he asks me if I would like to have a coffee. I accept. The magic always starts when you close that damned notebook. I laugh and I get a Coke. We talk about everything, of Monza, of the Formula One, of the charm of the Biranza’s track that you must see at least once in you life, of the roads we’ve here and of the many impatient drivers, of swimming, of books. He writes down the name of a French author who published a series of seven fantasy books. “A great imagination is needed” he says. It’s the best time of the day, I know it well. I thank Tony, we shake hands. See you tomorrow, I say. I keep “Good Luck” for the start, some wishes weighs more in the moment right before the race. Automatically I cheer for him. Cycling is a too human sport to not to be linked to the person who does it. Here it works like in life: an instant of crazy happiness deletes days of effort, anger and tiredness. And a guy who wore the yellow jersey in a feast day, in the middle of three long and very tough weeks, knows it. Good Luck truly Tony. Touching wood, touching iron. Cycling is an universal place. 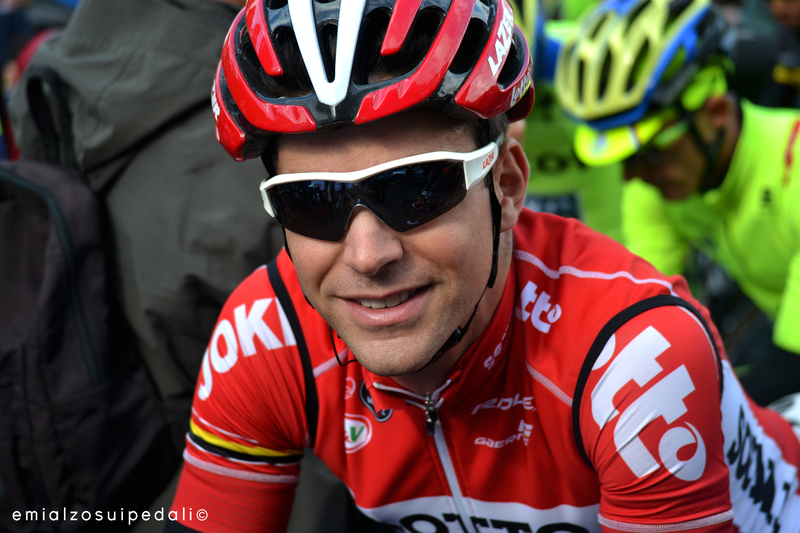 Thanks to Tony Gallopin for the time and to Guy Kostermans that made this interview possible.